Unlike some people Lucy knew she had a problem with her fertility when she was very young, but she didn’t feel she was given very good advice at the time. Eventually Lucy got treatment for polycystic ovary syndrome (PCOS), a common condition, but only after a long time and much heartache. 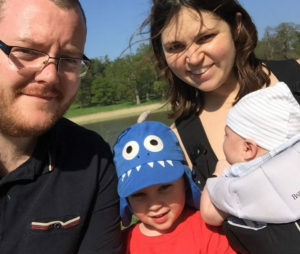 She and her husband Gerry are now proud parents of Finn, 3, who was conceived naturally, and Rory, who was born in April 2016 following IVF treatment at Bourn Hall. 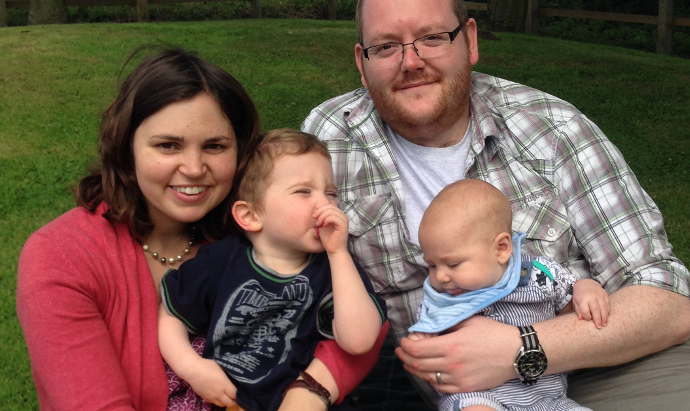 Lucy, from Norfolk, was diagnosed with PCOS at age 18 and it came as an enormous shock. She had already decided at age 12 that she wanted three children when she was older. She had even decided on their names, she laughs, as she cuddles three-year old Finn and 7-month-old Rory. Dr Thanos Papathanasiou, Lead Clinician at Bourn Hall Clinic Norwich, comments: “Although there are still many unknowns, scientific research is giving us a greater understanding of the causes of PCOS, which is leading to better ways of managing the condition and therapies that can help increase fertility. PCOS is a complex syndrome producing a variety of symptoms, which can make it difficult to diagnose and treat – but Lucy was exhibiting a number of the more common symptoms and so her mum pushed for her to get checked out. “I had hardly any periods since starting them aged 13 and at one point went two and a half years without having a period at all,” Lucy explains. “Throughout my teenage years I had to cope with excess facial and body hair and despite eating like a bird and running every day I struggled with my weight. Ten years later she fell in love with Gerry and the couple had a two-year engagement to save up for their wedding. Lucy went for hospital fertility tests where she was told again that her chances of conceiving naturally were very slim. 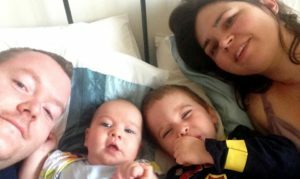 Lucy thinks this commitment paid off because the day before she was due to embark on a course of fertility drugs she found out that she had fallen pregnant naturally. Lucy and Gerry were over the moon and in July 2013 son Finn was born. Just before Finn’s second birthday Lucy was ecstatic when she found out she was again pregnant naturally but her joy was short-lived when she suffered a miscarriage. Lucy was treated at Bourn Hall Clinic using IVF, which involved her taking fertility drugs to stimulate her egg production, before the eggs were collected and mixed with Gerry’s sperm in a culture dish for fertilisation. A resulting embryo was then transferred to Lucy’s womb. The hardest part of the whole process, she recalls, was the two-week wait after she had been treated before she took her pregnancy test. The couple were delighted when the test came back positive and Lucy gave birth to second son Rory on April 1, 2016. “I was just so impressed with Bourn Hall,” she says. “The whole experience was just so professional, caring and personal. If you are concerned about your fertility, Bourn Hall provides Fertility Health + Wellbeing tests – read more here. Lucy’s story has also appeared in the Eastern Daily Press – you can read more here.